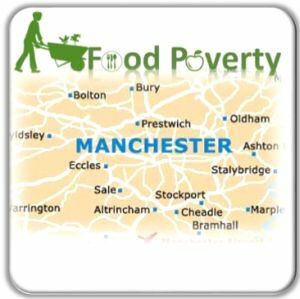 The most well-known food bank service, The Trussell Trust now has 54 distribution points in Greater Manchester but there are many more emergency food providers including churches, community centres, charities, and local action groups. In Greater Manchester, GMPA has mapped 155. As we reported in our newsletter of November 30th, only thirteen years ago there were almost no food banks in the UK. They already existed in many European countries but from 2004 they began to spring up here in every town and city. The financial crisis and austerity measures since have seen them become a part of our landscape. There are now an estimated 2,500 places in the UK where those in need can collect a food parcel. One of our first objectives was to create this food map as we believed that a single source currently didn’t exist and we hoped that it would be useful and informative. An almost unexpected outcome has been that it is also a very powerful image demonstrating how critical the situation in the region is at the start of 2017. The GMPA Emergency Food Providers map is freely available to everyone in the hope that it will be of assistance to advisors when directing people to their nearest, accessible foodbank. We would welcome information about any foodbank we may have missed and we are short of some items of data such as hours of opening or referral method for a few food banks. We also understand that a food bank may not wish to be shown on the map if they are already overwhelmed by local demand. We are happy to amend the details to reflect this although we would prefer to keep a pin in the map for every food bank in existence in order to make the level of need crystal clear.